Protect your Milton home with improved attic insulation. decrease your heating and cooling costs by up to 20%! The Ontario Building Code was updated in 2017. If your home was built before then and the insulation has not been upgraded recently, your insulation is not protecting your home properly. The updated insulation standard is now R60. This applies to Milton insulation in homes. VK Roofing is your Milton insulation installer. We are a certified Owens Corning insulation installer, serving Milton, Georgetown, Halton and Mississauga. We use AttiCat, Canada’s #1 inslulation brand. 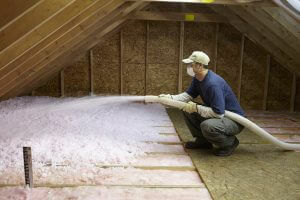 Our attic insulation installation process is meticulous and conscientious. Your home is our first priority. Drop sheets are used in any area where we will be working. Any old, damaged or ineffective baffles are removed, installing new ones where necessary. All pot light (or other recessed lighting fixture) backings are protected with fire rated covers. A weather-strip seal is added to the attic hatch to eliminate gaps for air loss. Styrofoam Sheet Insulation is also attached to the attic hatch to reduce heat loss and prevent air loss. Measure guides are installed to ensure a consistent R60 value of insulation is blown into the entire attic, as required by the Ontario Building Code. All garbage is removed and all debris is vacuumed. Contact owner Anthony Van Kooten for a FREE No obligation quote in Milton for insulation.